Chinese financial institutions are among the biggest banks in the world based on asset size, but only 15 hold investment-grade ratings from Fitch, Moody’s and Standard & Poor’s. A handful more hold sub-investment-grade ratings, usually in the BB range. But the vast majority of China’s banking system is uncharted by the major rating agencies. Global Finance’s ranking of the Safest Chinese Banks includes those financial institutions that hold an investment-grade rating and that also feature among the biggest 1,000 banks in the world ranked by assets. At the top of the scale, three Chinese banks hold two AA- ratings and one A+, which places them comfortably among the 50 Safest Global Banks and near the top of the rankings of the Safest 50 Emerging Markets Banks. The three banks are China Development Bank, Agricultural Development Bank of China and Export-Import Bank of China. Below them, four banks hold two A ratings and one of A+, falling short of the score needed to be included in the Global 50, but placing them easily within the Safest 50 Emerging Markets Banks. These four are Industrial and Commercial Bank of China, China Construction Bank, Agricultural Bank of China and Bank of China. The Bank of Communications also has two A ratings and one of A-, enabling it to rank among the Safest 50 Emerging Markets Banks. Seven other banks hold investment-grade ratings from at least one of the three international credit rating agencies. These are China Merchants Bank, China Citic Bank, Shanghai Pudong Development Bank, China Everbright Bank, Bank of Ningbo, Ping An Bank and Bank of Shanghai. Shanghai Pudong Development Bank and Ping An Bank both hold a sub-investment-grade rating from Fitch alongside an investment-grade rating from Moody’s. 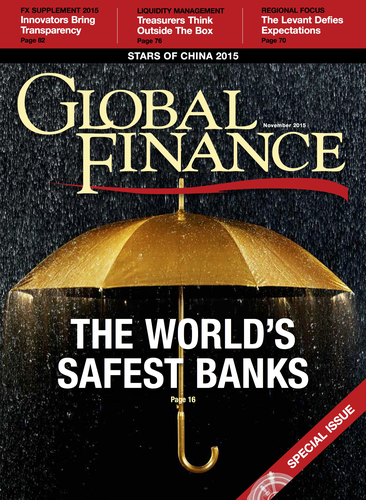 Last year Global Finance ranked the Safest 10 Chinese Banks. All 10 retain the same positions in the ranking that they held last year. China Citic Bank was upgraded by Moody’s in November 2014, but this did not change its position in Global Finance’s rankings. The scoring methodology used by Global Finance to rank the Safest Chinese Banks follows that used in its other Safest Banks rankings. A rating of AAA is assigned a score of 10 points, AA+ receives a score of nine points, down to BBB- which scores one point and BB+ which scores -1 point, and so on. When a bank has only two ratings, an implied score for the third rating is calculated by taking the average of the other two and deducting one point. When a bank has only one rating, an implied score for the second rating is calculated by deducting one point from the actual rating, and an implied score for the third rating is calculated by deducting two points from the actual rating.